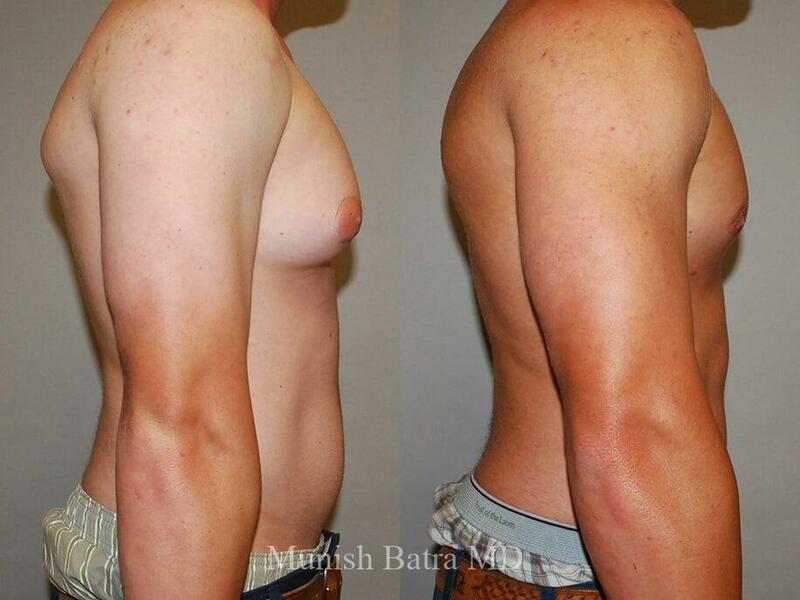 Gynecomastia is a condition characterized by excess fat and breast tissue in the male chest. While this condition often becomes apparent during adolescence, it can affect men of all ages. Hormonal changes, weight gain, use of certain medications, excessive alcohol or marijuana use, or the use of steroids all increase your risk of developing gynecomastia. This condition often results in a loss of self-confidence and an increase in anxiety, especially in social or intimate situations. Gynecomastia surgery removes excess fat and tissue from the breasts for a smoother, flatter, more masculine chest. Excess tissue and fat can cause your chest to look feminine or make you look heavier than you actually are. Gynecomastia surgery provides a more masculine chest by smoothing and enhancing the contours for a stronger, firmer figure. Gynecomastia can be distressing for men of any age and can result in insecurities about one’s appearance. Gynecomastia surgery aids men suffering from the emotional complications of having enlarged breasts. Just as large breasts can cause discomfort for women, enlarged male breasts can also cause discomfort. Folds and creases of extra skin can cause irritation, and the excess weight can be uncomfortable. Gynecomastia surgery can remedy these issues. Liposuction can be used for patients whose gynecomastia is limited to excess fat in the breasts. Fat is removed with a small hollow tube (known as a cannula) through small and inconspicuous incisions made in the breast area. If excess breast tissue is the primary cause of your gynecomastia, surgical excision is used. An incision is made around the areola, and excess skin and tissue are removed. While some patients may need only liposuction or surgical excision, the majority of patients require some combination of the two. To do this, Dr. Batra first removes the excess fat through liposuction and then removes excess tissue and skin. Combining these techniques allows for better results. Rest is vital during the initial stages of your recovery. Your recovery will typically last for seven to 10 days, at which time you can return to work and your normal day-to-day activities. All strenuous exercise, especially the lifting of any weights, should be avoided for at least six weeks to ensure proper healing. Your results will become apparent once the swelling and bruising subside. Results are generally permanent as long as you maintain a stable weight and avoid using steroids and certain medications. Swelling, bruising, and soreness are common following your gynecomastia surgery. Compression garments should be worn during the initial days and weeks to reduce swelling, increase circulation, and promote healing. Prescription pain medication can be taken to help relieve any discomfort. Scarring after gynecomastia surgery is limited. The incisions from liposuction are small, and any visible scarring will be minimal. The incisions used for surgical excision are hidden in the shading of the areola. Any visible scarring will fade with time. The cost of your gynecomastia surgery will vary depending on several factors. These factors include the extent of the procedure and the techniques used as well as anesthesia, facility, and surgical fees. The staff at Coastal Plastic Surgeons will provide you with an accurate cost estimate during your consultation. Gynecomastia surgery benefits men of all ages who are distressed about the appearance of their enlarged breasts. During your consultation, Dr. Batra will try to identify the underlying cause of your gynecomastia, as situations such as weight gain or certain medications can be remedied by losing weight or stopping the medication. If no underlying cause is discovered and you have an excess amount of breast tissue or fat, gynecomastia surgery may be right for you. Patients should be in non-smokers in good general health, with realistic expectations of their results and the willingness to follow all pre- and post-operative instructions. How long will gynecomastia surgery take to complete? Gynecomastia surgery typically takes around two hours to complete. The procedure is often performed under local anesthesia. Can you combine gynecomastia surgery with any other procedure? Gynecomastia surgery is generally performed as a standalone procedure. Occasionally, male breast reduction can be combined with additional liposuction or abdominoplasty. What are the potential risks associated with gynecomastia surgery? Why should I choose Coastal Plastic Surgeons? 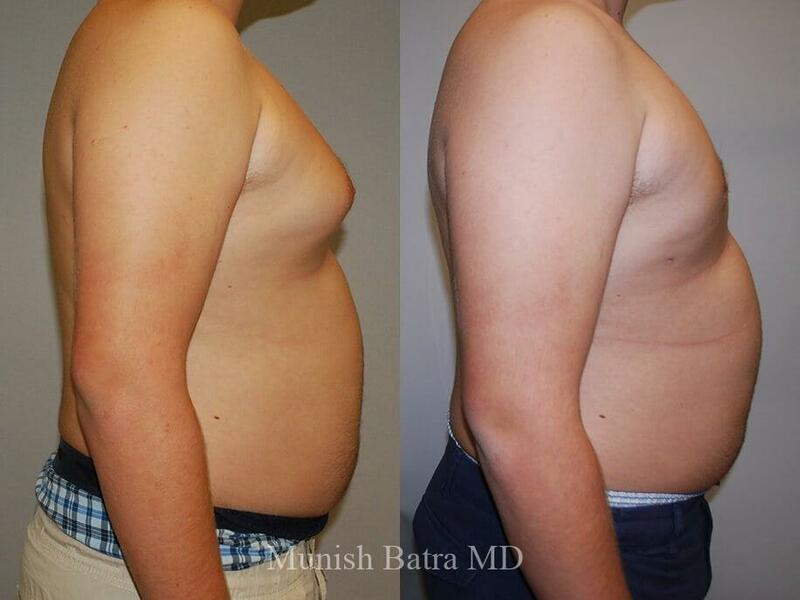 At Coastal Plastic Surgeons, Dr. Batra specializes in body contouring procedures, such as gynecomastia surgery. Patient trust and comfort are of utmost importance to Dr. Batra, and he treats all patients with understanding and compassion. In his experience, patients who are comfortable and relaxed about their procedure receive the best results.